August 1981 article in Charlotte Observer about the move to WPCQ. During the late summer of 1981, Jim Crockett Promotions moved their television tapings from their long time home at WRAL in Raleigh to the small studios of WPCQ TV in Charlotte. The first taping was Wednesday night, August 5. The change was brought about when WRAL began carrying the "PM Magazine" show which required the use of the studio for taping of the local segments of that show. There was also the issue of the local news broadcast expanding to an hour, placing more demands on studio time. Reportedly, the move was scheduled for WCCB-18 in Charlotte, across the street from the old Charlotte Coliseum, but that plan fell through and they hastily changed plans and moved to WPCQ. The WPCQ studios were hardly suited for wrestling. The ring had to be set in the studio at an angle in order for there to be room to fit in the cameras, announce desk and the studio hosts. Everyone involved reportedly detested these conditions, but regardless, the small confines were home to Crockett TV wrestling for nearly two years before moving out into small arenas to tape the weekly shows in 1983. WPCQ was also the home for the short lived East Coast Wrestling which showed arena matches and older studio tapes. The show was hosted by veteran Charlotte wrestling broadcaster Big Bill Ward. Rich Landrum, Bill Ward, David Crockett, others - names unknown. 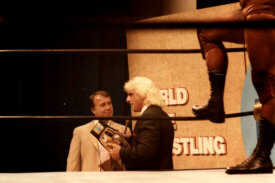 Two photos of NWA World Champion Ric Flair on the set of both programs taped at WPCQ studios. (L) Bob Caudle interviews the champ on the set of Mid-Atlantic Championship Wrestling as co-host Sandy Scott waits off camera. 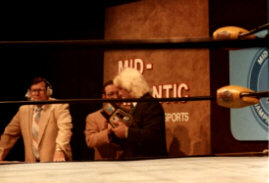 (R) World Wide Wrestling host David Crockett interviews Ric Flair. An unidentified wrestler waits for his match in the ring. The clipping above was found in Johnny Weaver's personal scrapbook when we visited with him in November of 2007. The 2nd part of the article was not included. At some point, I am going to try and check the microfilm archives at a library and find the rest of this article, which provides some good information about the move from WRAL in Raleigh to WPCQ in Charlotte. Mid-Atlantic Championship Wrestling is on the air – actually, on tape – and with its companion show, “Wide World Wrestling,” soon will air on 26 stations in 19 markets. Both hour long programs are taped on a single (very long) day. Producer Jim Crockett, President of Jim Crockett Promotions, routinely arrives at the studio at 10 am and does not leave until 13 hours later. Wrestling is a venerable television programming staple. In 1948, there were four live network prime-time wrestling shows weekly. Those died within a few years, but syndicated wrestling programs still appear in virtually every television market in the nation. Atlanta’s WTBS (Charlotte Cable 6) brings three hours of weekend wrestling to its large national cable audience. Both programs are offered on a barter basis. The stations receive the shows for free and have a few commercial minutes to sell. In exchange, the Crocketts get commercial for their matches. For the past five years, tapings were anchored at Raleigh’s WRAL-TV, but a crunch on studio time caused by that station’s “P.M. 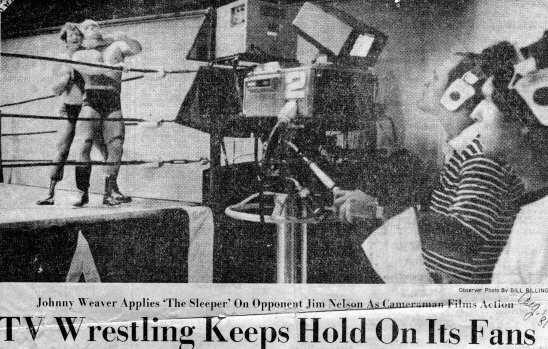 Magazine” and a proposed hour-long newscast meant there was insufficient time for taping the wrestling show. 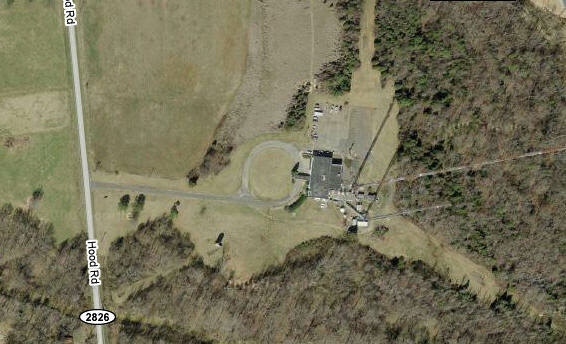 That is how Charlotte’s WPCQ-TV got to be the new home base. The station signed on in 1968 as WCTU-TV, North Carolina's first independent station. Jim Bakker began his television ministry at WCTU shortly after he broke off from Paul Crouch and TBN. Other than the religious shows a couple hours a day, the station aired cartoons, sitcoms, old movies and sports. The station hit hard times financially and was put up for sale in 1972. Ted Turner bought the station in 1973 and renamed it WRET (after his initials, Robert Edward Turner). He retained the entertainment format and made it stronger. He made the station profitable almost immediately, as he did in Atlanta with what became WTBS. In 1978, ABC moved its affiliation from WCCB-TV to WSOC-TV. It was widely expected that WCCB would simply swap affiliations with WSOC and become the NBC affiliate, but Turner scored a major coup when he won WRET the NBC affiliation. A few years earlier, the station had been on the verge of closing down. Turner sold about half of WRET's programming to WCCB, including cartoons, older sitcoms, and movies. The station also began a newscast. Turner sold the station to Westinghouse Electric Corporation (Group W) in 1980 in order to free up cash to start up CNN. Under Westinghouse, the station changed call letters to WPCQ-TV, and added more game shows and talk shows to its lineup. It was the only UHF station owned by Group W, and the only Group W station without news, which was cancelled shortly after the purchase. There was virtually no newscast from then until 1986 aside from hourly cut-ins. Even some of Group W's popular shows, like PM Magazine and Hour Magazine, were seen on statons other than WPCQ. Renaissance Broadcasting bought the station in 1985, and renamed the station WCNC-TV (for Charlotte, North Carolina) in 1988. Soon afterward, it moved to channel 6 on all Charlotte area cable systems and began promoting itself as "WCNC-TV36, Cable 6." The Providence Journal Company bought WCNC in 1990, and merged with Belo in 1997. From 1996 until 2003, the station was known on-air as NBC6, after its cable location. It still calls itself "channel 6" on-air. The station stumbled in the ratings for much of the 80s, when it was the third station it what was essentially a two-station market--even with NBC's powerful Thursday night lineup. It didn't have a lot going for it, as its major rivals, WBTV and WSOC, had been on the air since the 1950s. Also, longer-established NBC stations in Winston-Salem, Columbia and Greenville were available over the air and/or on cable in much of the Charlotte market, significantly cutting into ratings. But many of this station's problems were of its own making. Besides the lack of a newscast, its signal was much weaker than was usually expected for a network affiliate, at only 2.1 million watts. When it restarted a newscast in 1986, it initially scheduled its evening news for 5:30 pm--Charlotte's first drive-time newscast--knowing at the time that it couldn't compete with WBTV and WSOC at 6 pm. It expanded the 5:30 news to one hour in 1987 and boosted its signal to 5 million watts. It finally added a 6 pm newscast in 1988. However, it still dragged in the ratings until after Belo assumed control. When Belo took over in 1997, it invested large amounts of money in the station by hiring talent away from rival stations. Belo also invested large amounts of money into new sets, a news helicopter, a powerful live doppler radar system and other equipment. For much of the early part of the 21st century, it has waged a spirited battle with WBTV for second place behind WSOC.